Bat, ghost and pumpkin shape pop tarts with a tangy, black grape jam filling coated with a spooky purple and green glaze. Also if you have been following me you know that I like to use seasonal produce. I've created recipes with local strawberries and seasonal Meyer Lemons a couple of months ago. The seasonal produce that I will be using for this post is, seedless black grapes. Black grapes are not that much different in taste, they are slightly more tart than red grape or green grapes. The grape are also not actually black like a midnight sky but they are a dark rich purple color. These tasty pastries can be cut into anything that you like but I used two different sizes of pumpkin, bat and a ghost. 1. Black Grape Jam: In a large pot on medium high heat, add washed black grapes, lemon juice, lime juice and sugar. Bring it to a boil for 20 minutes. Mash the grapes with a potato masher to release the juice and break down the grapes. Remove from the heat and either use a stick blender, blend or food processor until it is thick syrup. Place it back on the heat and let it boil for 20 to 25 minutes or until thick. Let it cool in the pot for 10 minutes then transfer in a clean mason jar. Let that cool to room temperature before storing in the fridge. It will thicken even more as it cools. 2. Pastry Crust: Grate frozen butter into flour, sugar and salt. Gently work the butter and flour with your fingers to coat all the butter. Add in 1 tablespoons of really cold milk at a time until it just forms a ball if you press dough together. Lay a piece of cling wrap and divide dough into two pieces. Chill dough for 1 to 2 hours. 3. Sprinkle a little flour on a clean counter top and roll dough to 1/4 inch thick. If the dough starts to warm up place in the fridge for 5 to 10 minutes. Line two to three cookie sheet with parchment paper. 4. Cut dough with cookie cutters. Add a round tablespoon of jam onto one of the cut crust, leave a little edge so it doesn't ooze. Place the other cut crust on top. Press the edges down with your finger then press a fork along the edges. 5. Chill the dough for 15 to 20 minutes or until firm. 6. Preheat oven to 350 degrees and poke holes into the tops. Bake for 12 to 15 minutes or until lightly golden brown. Rotate pans after 6 minutes of baking. 7. Let pop tarts cool on the cookie sheet for 5 minutes then transfer to a wired rack to cool completely. 8. Glaze: In medium size bowl, whisk together confectioners' sugar, lime juice and milk until thick. Divide the glaze into two bowls, color one bowl with violet food coloring and the other with green and yellow. Spoon on one color glaze then drizzle the other color. Let the glaze set for 30 to 45 minutes or until completely set. Store in a cool area of your kitchen or fridge. OMG! My kids love pop tarts! I am so going to have to make these! Cookies that 'bleed' for Halloween? Perfect! Cookies which 'bleed'? All I need for Halloween and more! yummmm!! How cute & unique!!! I love the halloween look! These would be so much fun to make with kids! These look DELICIOUS. I can definitely appreciate how spooky they look, too! These look so fun. My kids would love them! I love this post of you it gives me an idea on what to make for Halloween. I enjoy having a party in our house with family and friends, enjoy the food and good conversation. How cute are these! I love the green and purple colors - so perfect for Halloween! That is such a cool color combination. These tarts look delicious! Yum and FUN!!! Looks like it would be a great treat for a Halloween party! I love the colors too! These are so much fun! My kids would love to make them! These look great. Wish I could taste it right now.And the best part is that it goes with the theme of Halloween. These look so easy to make and delicious too. They make a perfect spooky Halloween treat. These look so cool, such great colors you achieved, and they sound delicious. I bet kids would love them! Wow cool designs for the occasion. The designs are eye catchy. I must check out the flavour now. I've been looking for an alternative for sweets and chocolates for this Halloween. I'll definitely be trying your recipe this year. I'm sure the kids will love it. OMG these look so good. I love your use of seasonal fruit, always makes things easier and more satisfying. Great decoration too. Thanks so much for helping to get us in the Halloween mood! I love the colors of these cookies and the idea of bringing in seasonal fruit filling is great. So much fun to make and I bet they taste great! Well first: yummy! But second - what fabulous design! So creative and cool! Oh my goodness these are awesome! And sound simple enough to make and can probably use the recipe for other holiday! I love it! I can't wait to make these with my littles! I love the colors and I love the idea of seasonal fruit filling! These look delicious...and more love to it as it is made from seasoned fruits only. This looks so yummy to eat! I like the colors, and how simple it is to make. These look so delicious and are seriously perfect for the upcoming fall season. I'll need to make some! These are so cute and such a great idea! My kids LOVE pop tarts, so I need to make these with them soon! Perfect Halloween activity too! These are such a cute idea for Halloween, my kids will love making these, thanks for sharing the recipe! I love all the creative and spooky food ideas! How fun to be a kid and enjoy these treats! I've seen a couple recipes for homemade poptarts -- but these are definitely the most fun! Just might have to try these with the kids this Halloween. I know they'd love all the festive colors and shapes. I love these for halloween and fall! The pops of color are a cute touch too! I've never made homemade poptarts but I know that my kids would LOVE these! These are so cute an colorful! They sound super yummy too! My son is obsessed with pop tarts, he would love these for Halloween, cool idea! These are great for the season. A nice change from candy! Thanks for the recipe! Wow! 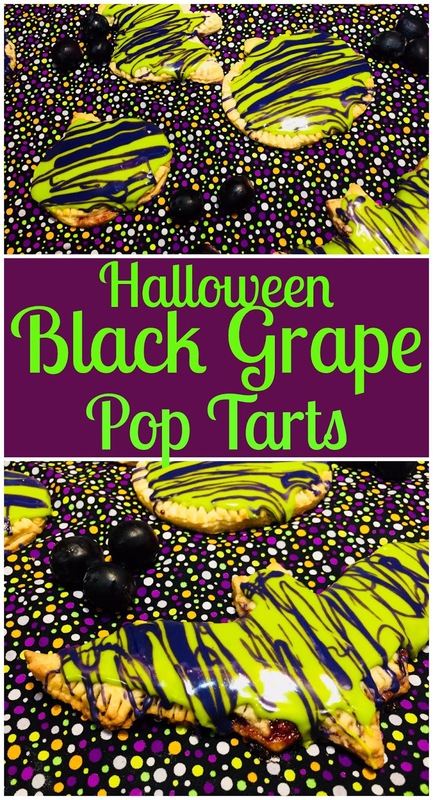 The black grape pop tarts look super delicious and easy to make. I like your innovative way of shaping it into bat, pumpkin and ghost. It perfectly matches the halloween theme. I'm always looking for dessert treats for Halloween and these are perfect for the occasion - just love the spooky colors and the different shapes to choose from. Thanks so much for sharing this recipe - Love it! Oh now thats creative and cute! I bet kids would love theses for sure! These are so fun for Halloween and I love the bat shapes! I need to look out for black grapes too because I think I have only had green & red ones. Gosh! These are the most "Fun" est pop-tarts I have laid my eyes on! The green looks insane... cant wait to try this out. My family ate pop tarts all the time as a kid, but the ones you buy from the store. I have always wanted to try my hand at making them at home!